* STRONG FOLDING FRAME DESIGN. The bike is in a new version as the bike tube is thicker 1/2 than before meaning the folding frame strong and stable enough to hit the trail,portably to store and transport the bike in your car or other conveyances. And it can carry a load of 300lb quite easily. * POWERFUL MOTOR. MOTAN M-150 P7 comes with a high speed power motor rated at 750W. The motor is 48V*750W High speed rear hub brushless motor with special design for snow, beach, hard and uneven, swamp and damp, even all terrains. 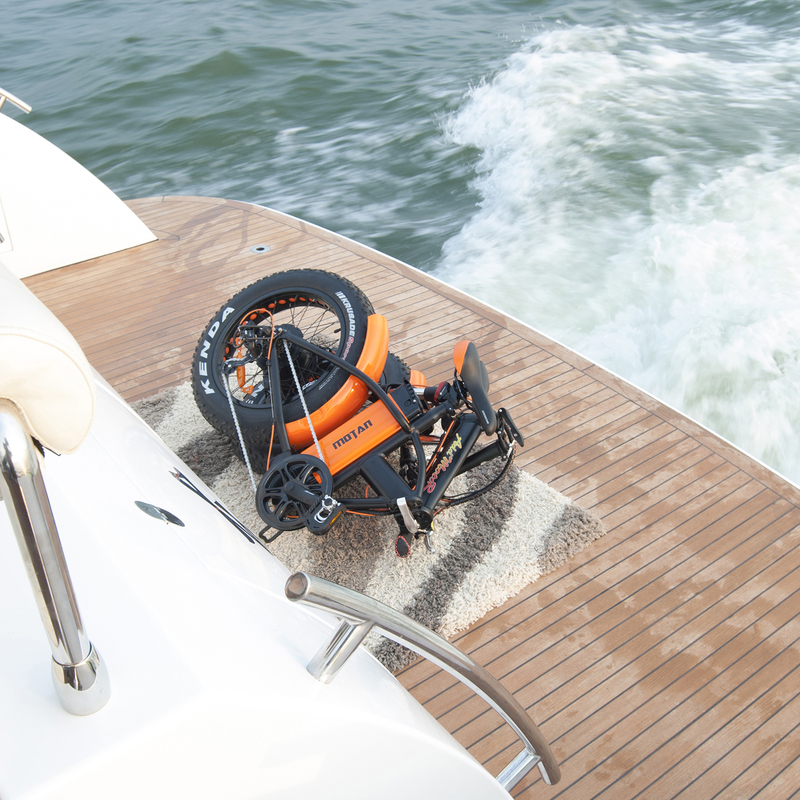 You don't need to worry about your bike breaking down on hard terrain. This piece of carefully conceived technological ascension will leave you baffled. * LONG LASTING LITHIUM BATTERY. 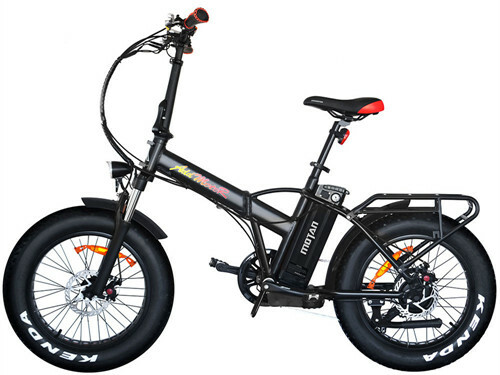 The bike is equipped with a high capacity 11.6AH lithium battery and it's life will never disappoint as a single charge in a span of 4-6 hours can last for long distances up 45-55 miles using the level one pedal assist, charging time depends on the current status of the battery. * ADDMOTOR 5 INCH LCD AUTOMATIC LIGHR SCREEN DISPLAY. A 5 inches LCD display is mounted on the front tube which comes with light sensitive technology and a USB port to charge your phone or electronic device on the go. * ADJUSTABLE HANDLEBAR AND SADDLE. Both the black lithium handlebar front tube and the pretty comfortable saddle can be adjusted according to the height. Appropriate height for this bike is 5'4''-6'4''. * MOZO FRONT FORK SUSPENSION. 40MM travel front fork suspension makes the biking trip comfort and smooth. * COMES WITH A PAIR OF FENDERS ADN A REAR RACK. MOTAN M-150 P7 E-bike of the Newest 750 Watt high-speed motor will make you feel like superman and pushes you powerful forward. A upgraded 48V 11.6AH long lasting battery and improved reliability. You could go places that your traditional bike would never allow.This e-bike allows you to ride more difficult trails for longer distances. You will see, once you got on this power fat folding bike you never want to have another one. Strong aluminium alloy folded frame,beautiful and easy to put together.Collapsible top-tube, frame and pedals in 10 seconds, easily store into any vehicle and transport the bike. The new upgrade strong and stiff aluminium alloy rear rack,can be easily assemble and disassemble, achieving multiple use in daily life. It will be a good helper riding the bike when going shopping, manned or carry something. Fashionable design, eye-catching. Get a few friends together and start you trip in the weekend and enjoy the time ! You can go to anywhere you want to go with this portable folding e-bike. So many people say "wow" when you ride it. It will be your favorite bike you have ever owned. 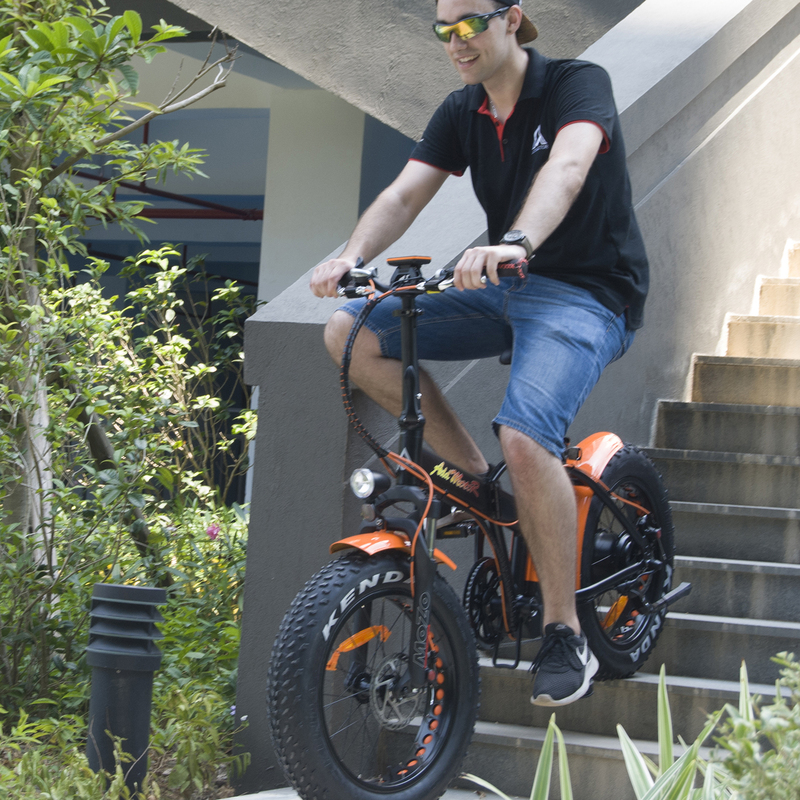 Distance: Electric Bicycle Single Charge Is 45-55 Miles Using The Level One Assist.